The Braves don't just call every player who's released, DFA'd, etc. But without exaggerating, I get asked about one to five such players. Every. Single. Day. Nobody's making fun. Just saying, I've never seen anyone suggest it's the best show ever. What must Vizcaino show to be a part of the medium-to-long-term bullpen plan? And if he develops, do the Braves feel good enough about a potential 'pen anchored by Avilan/McKirahan/Vizcaino/S.Simmons next year to make trading Grilli an option (even with a team option for next year), or do they hang on to him at the deadline with the intention of having him close in 2016, since there are no other experienced options (and Johnson's contract expires after this year)? What anyone else vying for such a position must show: First, that he can throw strikes consistently, avoid walks. Nothing, and I mean nothing, upsets Gonzalez and McDowell (and most other managers and pitching coaches) more than walking guys coming out of the bullpen in big situations. Viz has the stuff, just has to harness it, and by that I mean be able to throw innings consistently with good command. He'll get a chance. Needs to make the most of opportunity this year, after putting himself and, more importantly, the team in a major bind by using PEDs and getting caught. Freeman's wrist injury makes me think of Bob Horner. Should we be worried about a lingering, career-impacting thing? Way, way too early for that. Thanks for sharing your opinion of Wisler. I was really impressed when he threw that 2-0 two-seamer right on the hands of Braun for a simple groundout in the 1st/2nd inning last night. One pitch in a long game, but the polish is pretty apparent. That's the thing, he's able and willing to throw any pitch in just about any count. He doesn't back down, doesn't give in, doesn't leave a cookie over the plate even if he falls behind a guy. Too many pitchers do that. The Glavines of the world do not. Absolutely. Not even comparable. The Padres mortgaged the future, gave up tons of prospects and spent tons on free agents, and look where they are today. Ouch. There was a rumor last week about Braves looking for a young catcher and some speculated they'd talk to Brewers about lucroy. Have you heard anything while in Milwaukee? Nothing other than, Brewers love Lucroy (and their fans love him more), and right now it'd take a LOT to pry him away. where do the braves upgrade at the deadline? Well, they obviously could use another bat and another reliever, but it's not as simple as that with this team. By that I mean, they've said since early in winter they are making moves while walking two paths at same time, always looking at future and not willing to mortgage that to win now. But the other path is to be competitive now, and to me, if they trade away a big piece while still within 3-5 games of first place, it'll make it clear the future is not just a little more important than now, but a lot more. I do, however, think that emphasis on the future will probably give them all the reason they need not to spend big on a bat now, unless they really believe it'll be the difference-maker in getting them to postseason this year or possibly make a big difference in getting them past first round. But they won't make a long-term commitment to a big hitter. If they get a significant bat at all, I'm fairly sure it'd be a guy under contract only for rest of this season. Haven't heard that. Not saying it couldn't happen, and Braves obviously love the guy and what he brings a team. But don't know that they'd give up young talent to get him back AND take on rest of his contract again. But as I said, not saying it couldn't happen. Heyman obviously had a person tell him he thought it could. I don't know who told him that. No idea if it was someone in Braves organization. With the season JR Graham is having it looks like the Twins will keep him all season. Were you surprised he was not protected and are you surprised the season he has had? Surprised by season he's had, yes. And was surprised they didn't protect him, given a couple of the questionable guys they did protect, guys no longer on the team. But sure didn't think J.R. would regain all his velocity and pitch like he has this year. Happy for him. He's a good dude. Are you going to Cooperstown for the HOF ceremony? do you expect a significant payroll increase in 2017 or are the Braves always going to be handcuffed as Liberty Media's "tax break?" Yes, I'd expect payroll to rise a bit next season and more in 2017. They're going to want to be a big-time contender in the first year in the new ballpark, and it would not be a good business move to let $10M in payroll be difference in not filling an obvious need here or there going into that first season. Best way to get back any still-angry fans at that point will be to win. And win big. 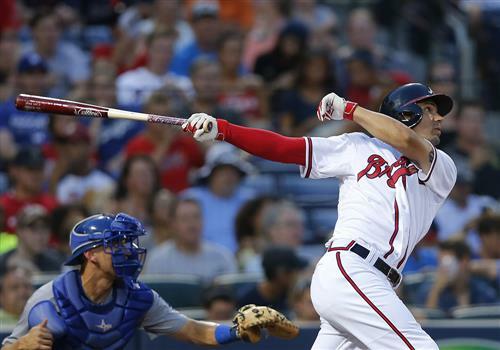 With Jace playing so well and Ozzie Albies absolutely smacking around low-A pitching and headed to the Futures game, do you think Jose Peraza is becoming a little expendable and possibly trade bait to use for a power bat? I know Albies is a couple years away but we will have Jace likely for that whole time. I've not heard Peraza specifically mentioned as trade bait, and won't just throw that around recklessly to start a rumor. But would it surprise me? Not really. It's been something to behold. If we had time to behold it. I mean, move-a-day Braves is barely an exaggeration. I've never seen anything quite like it. Any sign that AJ is getting worn down yet? I can't believe how good a catcher he has been for a 38 year old. Nope. The dude is a physical marvel, especially considering he's a big guy. But maybe that actually helps him hold up to the stress and collisions, etc., more than it might hurt him holding up in the heat of summer wearing all that gear behind the plate. Anyway, no, I don't see any signs of wearing down. Those who thought Bethancourt should just play 5-6 times a week regardless of performance, who were calling for A.J. to get benched when Pierzynski had a terrific April but terrible May, haven't said much since he bounced back with a good June and now is off to a fast start in July (seven hits past two games). In your entire time of covering the Braves, what is the most surprising move you have seen them make? Chris Johnson extension, the timing of which made no sense then and makes even less sense in retrospect. And the Kimbrel trade, and by that I mean the timing of it, with absolutely no advance warning. They made that move only because it allowed them to dump B.J. 's contract. Still, it was a major shock, coming on even of Opening Day. Going back further, the decision to dump Glavine the day before he was to come off the DL. That was cold and brutal. Is Bobby Cox still on the Braves payroll in some capacity? I know he was on the search committee for a new GM after Wren was fired. But you never see him around much anymore. Yes, he's a special advisor. And he comes to the ballpark some and, I'm sure, offers advice frequently via phone to some Braves officials. He and Fredi Gonzalez are close friends and talk frequently. Markakis has been really good for this team. He always had limited power and he said earlier that he is building strength after his injury this PS. Do you see him as a guy who can hit 15 HR a season over the next 3 yrs? I think he'll get back to being a 10-12 homer guy after a full offseason of conditioning and weight training, like he's always done in the past before last year's surgery prevented him from doing it at all. And I agree, he's been good for this team. He's basically a singles hitter right now, some doubles thrown in, but he gets on base a lot, plays a real solid defensive RF, and he's a consummate pro. Great to have some of those on the team. I absolutely was surprised. Didn't understand why they didn't wait and try to get more from him. Understood need to trade him, for everyone involved including Kyle, but didn't get why they didn't wait till at least the winter meetings and try to get something more for him. I liked him as a player. I understand that some of the last legislative action required in Florida has been just recently accomplished allowing the final hurdles to be cleared for the Astros and Nationals to move their spring training sites in central Florida to Palm Beach County beginning in 2017. Have you heard anything further regarding the Braves possible move from Wide World of Sports at Disney in Lake Buena Vista to either the east or west coast of Florida or renewal of their existing contract with Disney to stay in central Florida? Nothing new. But the Astros/Nats thing has been inevitable for months. To me, it seems inevitable Braves will move, since they won't have anyone except the Tigers within an hour of them after the Astros and Nats pull out of Central Fla.
Alright, folks. Great questions. Thanks for the passion and interest. Same time in two weeks (no chat next week due to All-Star Game). When does the lease with Wide world of Sports expire after the 2016 spring training or after the 2017 Spring training?